Head coach Scott Frost took a straw poll of his coaching staff in the middle of last week. He had already spoken with quarterback coach Mario Verduzco and offensive coordinator Troy Walters. He told them they weren’t making the decision then, just wanted to know where everyone was at. “It was consensus among the coaches that he gave us the best chance,” Frost said Monday during his first game-week press conference as the Husker head coach. “He” was called into Verduzco’s office Saturday night before the Huskers held their annual practice for the university students. “He” rode his scooter to the stadium feeling slightly uneasy about what coach and player would discuss but confident in the work he’d put in since January. “He” was announced Sunday morning. 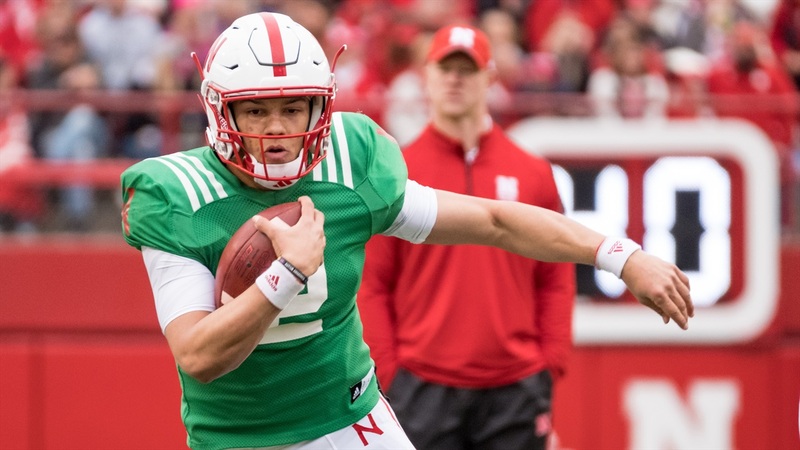 Adrian Martinez had won the Huskers’ starting quarterback position, the first ever true freshman to do so at Nebraska for a season-opener. But his dad told him the work doesn’t stop. The struggle isn’t over. Martinez said he wasn’t ecstatic for very long. Martinez said the plan in coming to Nebraska was for him to be the starter. He wasn’t trying to evaluate himself or set measuring points during the offseason, he just knew that if he took care of his business, things would sort themselves out. He felt like he was getting better with each day and learning the playbook. Frost said both quarterbacks — Martinez and redshirt freshman Tristan Gebbia — were throwing it well in camp. Martinez’s athletic ability proved to be the key. Neither quarterback competing for the job has thrown a collegiate pass. Frost said that’s not ideal to have but they’ll work through it. Mistakes will happen but the head coach wants his quarterback to be confident that he’s got the leash to work through things. Frost was hoping that would be the case with the guy who lost the competition as well, but that might not be so. But, Nebraska also wasn’t going to base its QB1 decision on future timetables. The 2019 season had no bearing on the 2018 decision, Frost said. To those that say Nebraska can’t, Frost says, “I don’t care what they think.” To those that say Martinez isn’t ready for all the responsibilities that come with being the starting quarterback at Nebraska, Frost says think again. “We’ve known Adrian was mature for his age for a long time, since we recruited him,” Frost said. “Getting here in spring was essential for him. That allowed him to get used to college life, get used to campus here, get used to a little bit of the spotlight, get familiar with things around here. It certainly helped him land where he is. In most situations, it’s hard for a first-year player to come in and earn the respect of his veteran teammates right off the bat. It can be especially hard to do so when you come in with the fanfare that Martinez came in with. Wasn’t the case for Martinez. “I think they were just waiting to see who we’d go with,” Martinez said. “We have a band of brothers and whether it was me or Tristan I think the guys would have been able to rally behind us and support us. I felt that support. The biggest remaining question mark surrounding the newly-minted starter is his arm. Martinez missed his entire senior season of high school football on a torn labrum in his throwing shoulder. He suffered the injury during football season his junior year but told a story Monday about playing through it for the entire basketball season. It’s the final game of the season in the final minute and Martinez gets a steal, he goes up for a layup and a defender takes a swipe at his arm. The trainer tells Martinez that he’s dislocated his shoulder and likely made the labrum injury worse. Martinez says he feels fine and plays through it. On the next play, his shoulder pops in and out of place again. Martinez said there were low moments, points in time where he couldn’t lift his hand above shoulder-level. They did. That first goal he set for himself at Nebraska — earn the starting spot — he’s accomplished. Now come the games. Martinez jokes he isn’t thinking about running out of the tunnel for the first time because he wants to sleep this week, but he’s not really worried about the pressure. Asked who Martinez reminds Frost of in that regard, Frost quipped that he “certainly doesn’t remind me of me.” He compared Martinez to UCF starter McKenzie Milton (a comparison former UCF safety Tre Neal also made an hour earlier). Martinez did have spring ball to learn. Most accounts say he does have that playmaker gene. Time to see it in action.